Corsage is made from a white material covered in a purple floral pattern. She has black button eyes and a purple embroidered nose. 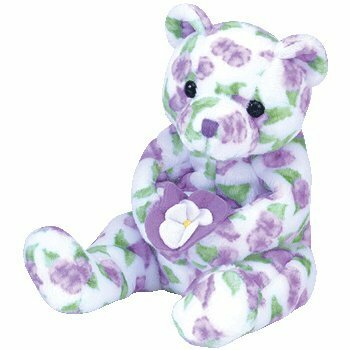 Corsage holds a purple and white flower in her paws. I’m the corsage you can’t resist! Corsage was released on 30th December 2003. Her birthday is on 12th April 2003. She retired on 16th July 2004.